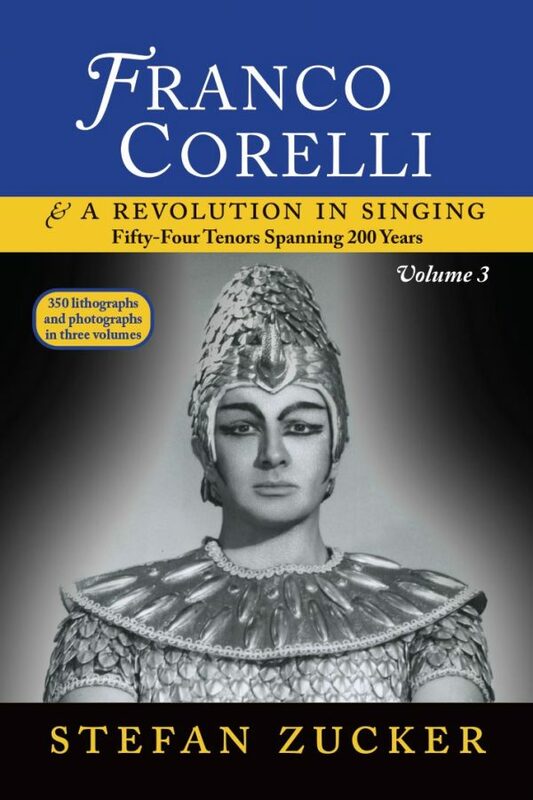 Customers Review Page – Franco Corelli and a Revolution in Singing, All three vols. Sign up here and start receiving our free newsletter. What's in Our Free Newsletter? Franco Corelli and a Revolution in Singing: Fifty-Four Tenors Spanning 200 Years, vol. 3 by Stefan Zucker, 6″ X 9″ X 358 pp. and 139 photographs, beautifully reproduced. This vol. contains interviews of Corelli, Bergonzi, Kraus and Alagna, among others. Bergonzi: “De Lucia, Pertile, Merli, Schipa, Gigli and Galliano Masini had their personal styles but weren’t faithful to the composer, because they introduced ritards, rests and effects. Del Monaco was the first singer to respect the composer. Toscanini and Bruno Walter were the only conductors who heeded what the composers wrote.” Bergonzi also declares, “The difference between my singing of Bohème and of Trovatore is the degree to which I cover. Rodolfo is a lighter role, so I cover less, but Manrico is more dramatic, so I cover more.” This statement proves controversial among others interviewed in this book. He describes his breathing method as well as the first five years of his career, when he sang as a baritone in casts that included Gigli and Schipa. 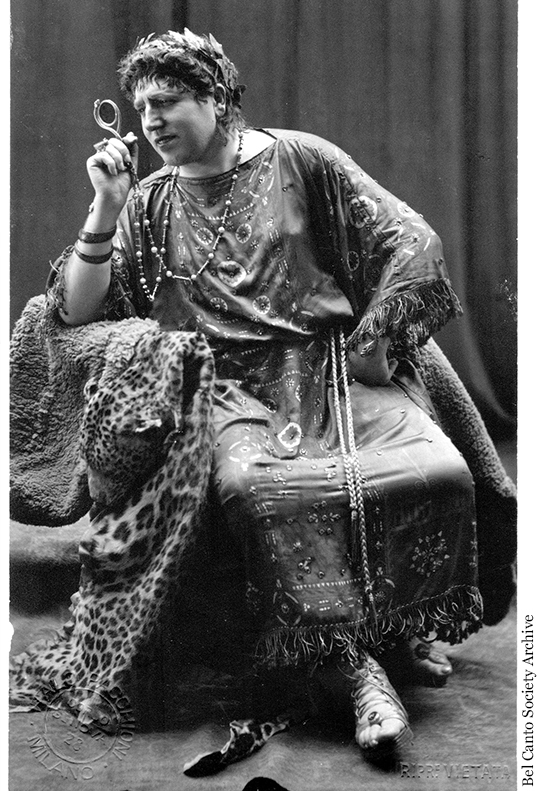 Kraus describes his vocal technique in detail, takes a stand against covering and for a variety of reasons excoriates Gigli, Lauri-Volpi, Caballé and Callas. He discusses being partnered by Callas in the Lisbon Traviata. The origins of lowered-larynx techniques. Jean de Reszke’s larynx-lowering (with many gorgeous photos from The Metropolitan Opera Archives). Caruso’s technique. Melocchi’s teaching of Limarilli. Corelli’s real view of the Stanley method. Marcello Del Monaco’s pupils, among them Giacomini, Martinucci and Lindroos. 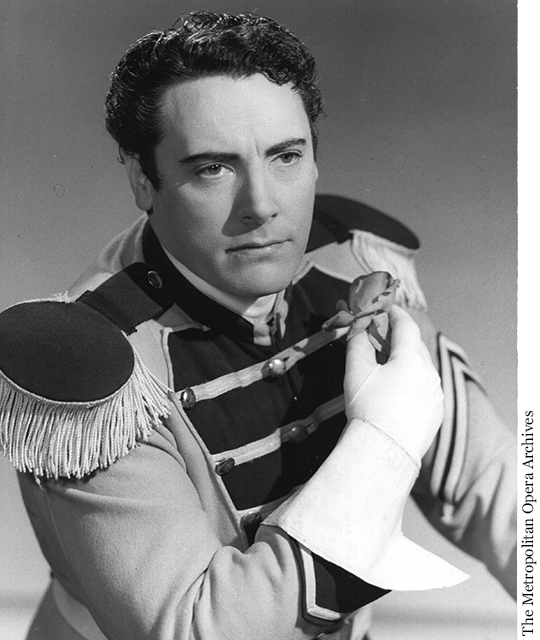 Tenor Emilio Moscoso on lessons with Marcello and Mario Del Monaco. A Corelli pupil, Enrique Pina, describes “floating” the larynx. Araiza’s describes combining larynx-lowering with mask placement. Aspiration. Matteuzzi and Morino—unaffected by Del Monaco and Corelli. Olivero attacks Del Monaco’s technique. 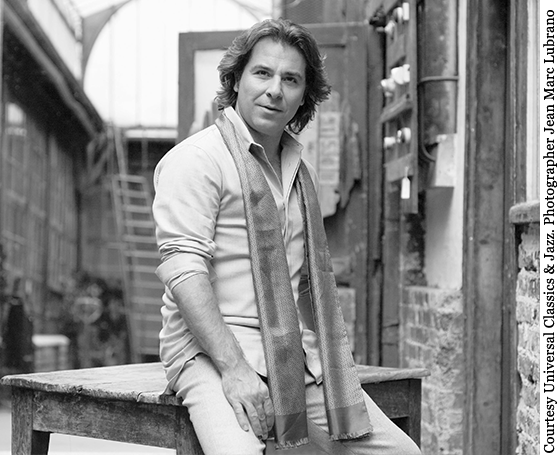 Roberto Alagna describes placing “behind the nose and between the eyes.” He explains that he sometimes switches to larynx lowering and re- corded an album with it. Like Corelli he learns technique by singing along with records—in his case Gigli’s above all—and recording himself doing so. He discusses tenors on old records as well as his personal life. Reviews of forty-seven CDs and DVDs of today’s top tenors, among them Kaufmann, who continues in Corelli’s footsteps, Cura, Villazón and Fraccaro, who continue in Del Monaco’s, Grigolo, Flórez, Brownlee, Banks, Filianoti, Cutler, Bros and Calleja, who continue in Kraus’s and Licitra, who continued in Bergonzi’s, as well as Galouzine, Beczala, Álvarez, Antonenko and Vargas. Corelli advocates that inadequate singers be booed, citing in particular Chris Merritt in I vespri Siciliani at La Scala. Listeners to “Opera Fanatic” confess their booing, including some who booed Corelli and the notorious organizer of the Scotto booings. Here is a PDF file of Stefan’s biography. See Stefan discuss Slezak and Schmidt. See Stefan interview Simionato, Pobbe, Gencer and Gavazzi. “Fanfare‘s readership, being record collectors, will be particularly intrigued by Zucker’s opinions about the recordings and videos of every current tenor of note; these appear in Vol. 3. He has decided views on the strengths and weaknesses of Jonas Kaufmann, Vittorio Grigolo, Juan Diego Flórez, et al. to whom he applies rigorous standards of vocal production as well as his own personal preferences. A taste in voices is a very personal matter for opera lovers, and a devotee of Flórez, is likely to nod in agreement when Kaufmann is criticized, and vice versa. Arguing silently with someone else’s opinions is endemic to music criticism, and Zucker offers ample scope for entering the fray. “Technical matters aside, opera is a gossipaceous arena, and these books are rich in anecdotes. Have you heard the one about Corelli and Boris Christoff fighting a duel with swords on the stage of the Rome Opera? The cause was that Corelli had taken Loretta Di Lelio, who subsequently became his wife, away from Christoff. The two combatants were both wounded. Do you crave inside knowledge about Corelli repeatedly sending his wife to Italy so that he could keep his mistresses away from her eagle eye, or how far he and Mario Del Monaco went to jealously undermine each other’s career? No one who loves opera is immune from curiosity about its scandals, rivalries, and intrigues. Zucker satisfies this curiosity in abundance. “Perhaps even more fascinating—and aimed higher—are the interviews with Corelli and other tenors, exposing their private opinions about a host of operatic subjects, including famous historical incidents. Corelli was intelligent and thoughtful, and being, for many, the prince among Italian tenors in his generation, he’s a credible witness to how opera looks from a conqueror’s vantage point. “For example, regarding the starry recording of Gounod’s Faust that Decca made with him, Joan Sutherland, and Nicolai Ghiaurov: ‘Ghiaurov screamed and was only good in the laugh [of Méphistophélès], Sutherland hooted. I was the only one who truly sang, with a free voice and an expressive top. I threw away some recitatives, though, because I didn’t know them well enough.’ Each reader will have to sort out ego, expertise, professional rivalry, and sharp-eyed criticism, yet all are intriguing elements in the serious-ridiculous-inspiring art of opera. “I can’t resist quoting a lengthy passage from a Corelli interview in Vol. 2 that centers on ‘the Rome walkout,’ a notorious incident in the career of Maria Callas at which Corelli was present. 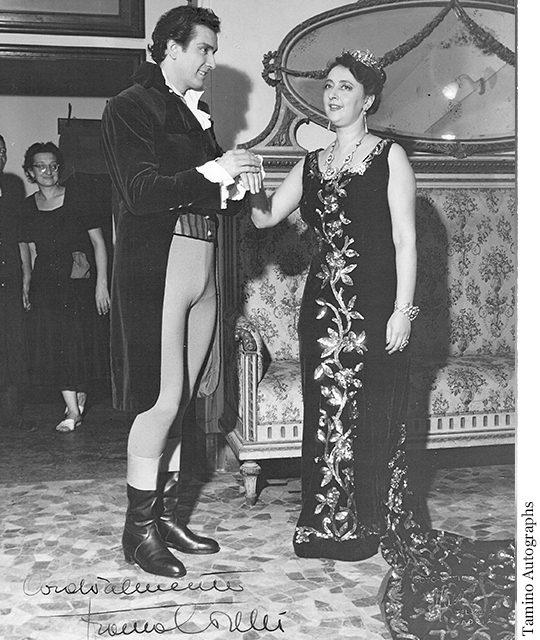 On January 2, 1958 Callas was starring in a gala performance of Norma at the Rome Opera, with the president of Italy and most of Rome’s social elite in attendance. When she walked out after the first act, a scandal ensued. Corelli was singing Pollione and he recounts the affair at first hand. “Corelli: Callas was a little sick, and that didn’t permit her to sing at her best. Some in the audience heckled her. When she came offstage after Act I, she was completely calm, but then she began to stew and announced she was canceling. The management went to her, to push her to continue the performance. She became a lioness and began to scream. She threw some vases and a chair. Little by little she lost her voice. When she left the theater, however, she looked elegant, as if nothing had happened. “Zucker: Are you suggesting that she could have continued the performance had she not started to scream? “Corelli: Absolutely. She was in possession of a fabulous voice and an excellent technique. As late as 1958 she was always able to sing. She could have continued. 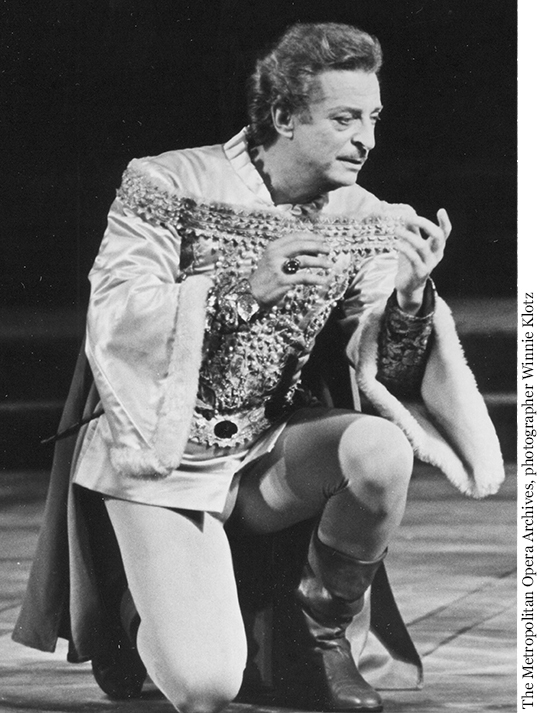 “Zucker is himself a tenor and hosted Opera Fanatic on WKCR-FM in New York for many years. Whether he is breaking down voice teaching into eight categories, interviewing illustrious tenors like Alfredo Kraus and Carlo Bergonzi (in Vol. 3), skewering three botched biographies of Corelli, or recounting, after interviews with over 100 singers how most handle the passaggio (the tricky break between the chest and head voice), Zucker has created three luscious page-turners. “According to him, today’s tenors are restricted to one or two modes of vocal production—the art of ‘chiaroscuro,’ as Zucker calls it, died with Beniamino Gigli. But one could as easily mourn the era when opera singing was a blood sport and tenors bought into their stage image as romantic ideals. Because of the unprecedented nature of these books, Fanfare published two reviews by two separate authors. The first is above. The second is below. “Stefan Zucker is well known to many of us who, to borrow his phrase, are ‘opera fanatics.’ As President of Bel Canto Society, Zucker has produced numerous recordings, both video and audio, documenting great singers throughout the ages. As host of the radio program ‘Opera Fanatic,’ which aired on Columbia University’s radio station, Zucker interviewed scores of opera personalities, including many of the finest singers, past and present (he was also editor of Opera Fanatic magazine). 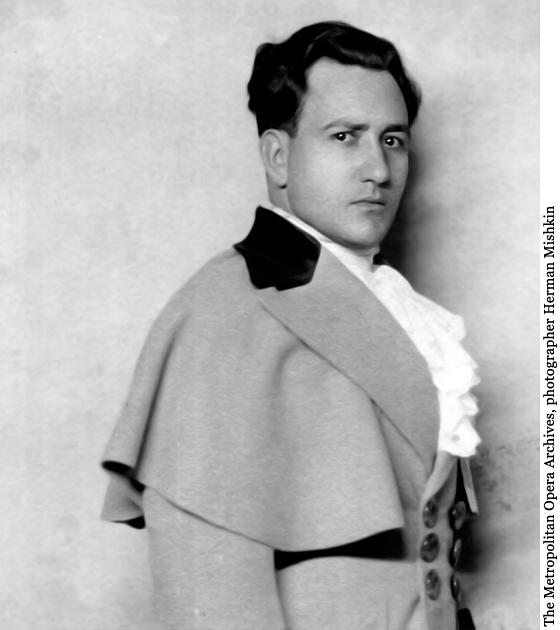 A singer who traces his lineage to 19th-century artists Giovanni Battista Rubini and Giacomo David, Zucker earned the title of ‘The World’s Highest Tenor’ from the Guinness Book of World Records when he sang an A above high C at the 1972 New York City Town Hall world premiere performance of the fourth version of Bellini’s Adelson e Salvini. Now he has written three books that are fascinating, thought-provoking, informative, and entertaining. “Volume I: Del Monaco, Corelli, and Their Influence; Nuance Versus Massive Darkened Tone; Donzelli, Duprez and Nourrit; Jean de Reszke; Tamagno; De Lucia; Caruso; Pertile; Martinelli; Schipa: Unaffected by Caruso; Schipa’s Specter; Gigli; Lauri-Volpi vs. the Verismo Style; Björling; Tagliavini; Richard Tucker; Del Monaco: Corelli’s Chief Role Model and Rival; Polar Opposites: Corelli and Di Stefano; Pavarotti; Domingo; Carreras; The Fluctuating Fortunes of Vibrato; Eighteen Radamès Recordings Compared; Appendices. “Volume II: Six Revolutions Have Shaped Singing; Seismic Shock (Gilbert-Louis Duprez and the high C from the chest); The Dying Out of the Castrati and Their Traditions and the Decline of Florid Singing; Heroes on the Rise; Last of a Breed (Rubini); Corelli: Tenore del Mondo; Corelli’s Covering; A Note on Vocal Placement; Corelli: The Hamlet of Vocal Technique—and Why His Voice Declined; Corelli’s Letters to Lauri-Volpi, 1962 (?) — 1973; Grace Bumbry; Callas Critiques Corelli; Lauri-Volpi Attacks Corelli’s Technique; Observations on a Career and a Life; Franco Corelli: Some Missing Information; To Return or Not to Return? ; Three Botched Bios; Fanizza Refutes Seghers; The Duel with Christoff and ‘Barbieri sola, sola’; Potter’s Corelli Chapter; Collaborating with Corelli; Appendices. 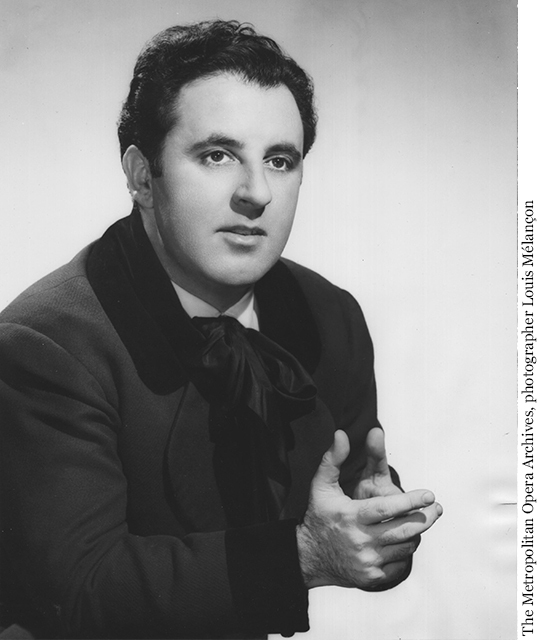 “Volume III: An Evening in the Theater with Franco Corelli and Stefan Zucker, Merkin Concert Hall, June 5, 1991; From Del Monaco to Chris Merritt; Booing: True Confessions; Conversations with Carlo Bergonzi; Alfredo Kraus; The Origins of Lowered-Larynx Techniques; Jean de Reszke’s Larynx-Lowering; Did Caruso Use a Laryngeal Method? ; Some Lessons with Melocchi (1879–1960); Corelli’s Real View of the Stanley Method; Some Mario Del Monaco Successors; My Lessons with Marcello and Mario Del Monaco (Emilio Moscoso); Del Monaco’s Diaphragm; A Corelli Student (Enrique Pina); Francisco Araiza: A Rossini Tenor Who Lowers His Larynx; Olivero Attacks Del Monaco’s Technique; Different Singing Techniques; The Rise and Fall of Elena Filipova; Roberto Alagna on Sometimes Using Mask Placement, Sometimes a Lowered-larynx; Bill Schuman, Marcello Giordani, Stephen Costello, James Valenti and Michael Fabiano; Four Lowered-Larynx Tenors (Kaufmann, Cura, Villazón, Walter Fraccaro); Mask-Larynx-Hybrid Tenors (Galouzine, Beczala); Mask-Placement Tenors Who Don’t Cover (Grigolo, Filianoti, Florez, Brownlee and Banks, Cutler, Bros, Calleja); Mask-Placement Tenors Who Do Cover (Álvarez, Antonenko, Vargas, Licitra, Botha); Summation. “Throughout the three volumes, Zucker spends a great deal of time discussing the ‘lowered-larynx’ technique, taught by Arturo Melocchi, and adopted by Corelli’s chief rival, Mario Del Monaco. That technique, as described by Zucker, ‘is based on singing with the larynx lowered to the bottom of the neck.’ According to Zucker and Corelli, this can lead to a vocal production capable of extraordinary power, but little nuance or dynamic variety. Corelli chose to adopt a variant of the technique, one in which the larynx ‘floats’ in order to allow for greater vocal pliability. But this is just one of many technical aspects covered; not only by Zucker and Corelli, but by several other singers interviewed by the author. And among the gems of these three books are Zucker’s interviews in Volume III with tenors Carlo Bergonzi and Alfredo Kraus, both masters of their craft who are able to describe their techniques and approach to performance in precise, compelling, and endlessly fascinating detail. [The purpose of the technical discussions is to show the choices and tradeoffs that caused tenor singing to evolve, from the late eighteenth century until today.—SZ] Other highlights are a series of letters written by Corelli to his teacher and friend Giacomo Lauri-Volpi (Volume II). The letters are quite touching, both for the respectful, tender way Corelli addresses his mentor, but also for the glimpses of self-doubt that begin to creep in during the early years of Corelli’s vocal decline. Also of considerable value are the various scholarly articles by Zucker that trace the history of tenor and castrato singing. Taking us from the sublime to the ridiculous is a 40-page chapter (Volume III) dominated by various opera fans who explain why they believe it is a higher calling to sabotage performances by booing, in order to demonstrate to the world they know more than anyone else. [Corelli advocated booing. Some of the listeners confessed to having booed him. He stood his ground.—SZ] If you are all too familiar with this type of buffoon, it will get your blood pressure going. It certainly did mine. And if you are at all prudish, be forewarned that these books include quite a bit on topics of a sexual nature. They range from the perhaps expected allusions to singers’ affairs and illegitimate children, to graphic discussions of sexual acts preferred by some artists (and even recommended by the author as a way to improve vocal technique!). The author provides fair warning that prurient subjects are on the horizon. But you are just as likely to encounter such material out of the blue (no pun intended). Of course, the concept of the operatic tenor as a sexually charismatic figure is undeniable, and has long been a subject of fascination and discussion. Perhaps the author, either by conscious or subconscious motivation, includes such material to advance discussion of that topic. I’m not easily shocked or offended, and these diversions did not impact my overall enjoyment of the books (they didn’t add to it, either). But in any case, you’ve been forewarned. “The author, an accomplished singer, former host of Columbia University’s radio show Opera Fanatic, and a preeminent scholar, shares transcripts of salon-style interviews in the 1990s with Corelli. As with the other volumes, the photographs included here, particularly those featuring singers in full costume, are quite stunning, capturing the visual glamour alongside the work’s deep, rich dissection of methods. “Franco Corelli Volume 3 arrived and any page that one finds is loaded with fascinating detail and beautiful photographs. There are many tenors mentioned including some current ones. This splendid book by Stefan Zucker deserves our plaudits, readership and thanks. Mr. Zucker may be an iconoclast but where else and who else can produce such a range of reading on the human voice. “Make a joyful noise unto the Lord” prevails in the brilliance, charm and love that Stefan Zucker has put into these volumes. They keep opening a magic box that modern events have tried to silence by declaring them of the past, forgotten, or of no use. Open the magic box and a pinata of voices come out to enlighten and make one listen to a continuing era of beauty, individuality and creativity!” Bravo Stefan Zucker! In the Bel Canto Society Store we sell hundreds of hard-to-find DVD, video and CD titles: operas, concerts, opera singers on film as well as classical instrumental performances. Plus opera music downloads (M4A & MP3 downloads), magazines, books, photos and posters. Order five items and receive a FREE sixth DVD, video, CD set, photo or publication in the Bonus Items List. What's in Our Free Newsletter?